Injuries are a part sports and little sympathy is given when they occur – just ask the L.A. Clippers who were without all-star forward Blake Griffin due to a staph infection – but to lose two of your best players, Monta Ellis and Tyson Chandler, shortly after the tip is hard to overcome. And despite a season high 26 point effort from forward Charlie Villanueva, the Dallas Mavericks dropped a tough one to the L.A. Clippers 115-98. The Clippers stumbled into the American Airlines Center having lost its previous four contest, including a 23 point blowout at the hands of the Oklahoma City Thunder on the front end of a back-to-back, but were able to get a much needed victory as one of its own walking wounded, JJ Redick, returned to the starting lineup. Redick had missed the previous three games due to back spasms but against the Mavericks he showed why he still is one of the most difficult players in the NBA to defend. The former Duke Blue Devil scored 15 points, including three three-pointers, which allowed his Clippers teammates more open shot opportunities as the Mavericks spent much of the night trying to contain the sharpshooter. “JJ plays tough plays hard and we are glad to have him back,” said Chris Paul who led the team in scoring with 25 points and 13 assists and benefited from having another scoring option to space the floor better than it had been in his absence. With the recent struggles there were voices outside of the Clippers locker-room that began to doubt the ability of the team to get it done this year and while the players and Coach Rivers denied that they were affected by it the play on the court said something differently. “You gotta look deep and look in the mirror to see what you can do better and collectively talk about it and have each other’s back,” said Jamal Crawford when asked how the team was able to overcome the outside distractions to play well tonight. “If guys made mistakes offensively and defensively it really didn’t matter because we were playing with so much energy that we covered for each other.” He did his part by contributing 22 points, and while he did not convert any of his five three-point attempts he had multiple open looks. Also stepping up in the absence of his “Lob City” co-pilot was Clippers center DeAndre Jordan. With Dallas losing Chandler one minute into the game due to injury, the 6’11 big man took advantage on both ends of the court on the way to scoring 22 points on 8-of-12 shooting while grabbing a season high 27 rebounds. And while L.A. held only a +6 rebounding advantage it was the timing of rebounds that doomed the Mavericks who seemed to struggle all night trying to find the right line-up combination. And when the Mavs weren’t having issues finding the right combination of player to play, the guys that were on the court never seemed to find a flow offensively. Outside of JJ Barea, who finished the game with 15 points with seven assists, the other guards didn’t contribute much. Devin Harris and Raymond Felton combined for seven points on 2-of-13 shooting and only had four assist between the two – if you consider Richard Jefferson’s production it doesn’t get much better, as he scored seven points but only made two of his eight attempted shots. With Rajon Rondo (facial fracture) out and Monta Ellis (hip) now unavailable, the all-star break couldn’t have come at a better time for a team that is starting to resemble a triage unit. But even when they do return, head coach Rick Carlisle and GM Donnie Nelson will have a major decision on their hands as they look to resolve the frontcourt woes… especially if they want the team to be a serious playoff contender. As of now the Mavericks are the 5th seed in the Western Conference and looking at every team in contention out west they possess something that Dallas is lacking – multiple options at the power forward and center position. While Mavs fans can expect consistent play from Dirk Nowitzki, what happens if Tyson Chandler is out for an extended period of time? The Dwight Powell and Greg Smith bench depth experiment has not gone as expected and while Charlie V can be a spark offensively as he was Monday, he still leaves a lot to be desired defensively. So while Coach Carlisle will have to make due with the current line-up against Utah on Wednesday, it wouldn’t surprise many to see additions to the roster in the future. According to ESPN, the team has already begun the process to bring back center Bernard James on a 10-day contract — contingent on him getting his FIBA clearance. And while Jermaine O’Neal is expected to be signed after the all-star break, the team is also contemplating acquiring Amar’e Stoudamire if his contract is bought out by the New York Knicks. And while O’Neal and Stoudamire are no longer on par with their former skill-set, they still can provide the Mavs a much needed boost upfront — will it be enough to make them championship contenders… only time will tell. 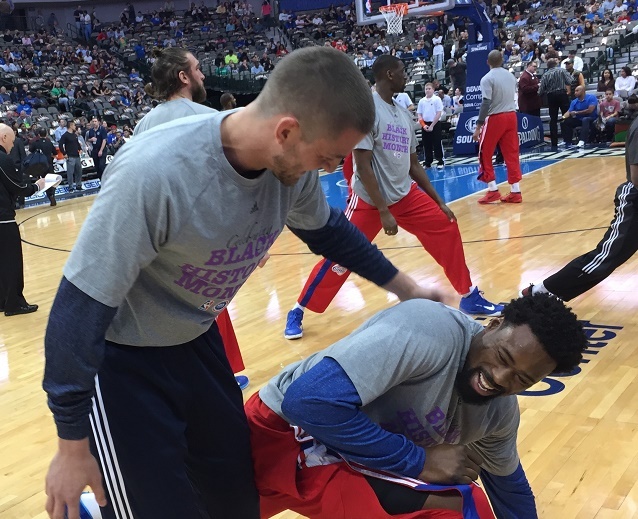 Could DeAndre Jordan’s Return to the Clippers be a Blessing for Dallas?